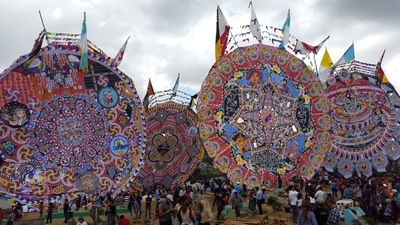 ​At first I couldn’t believe my eyes, these were the biggest kites I have ever seen in my life. 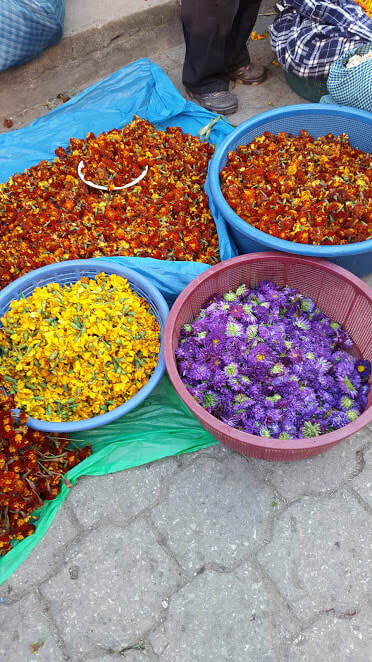 I first arrived in La Antigua on the evening of the 29th, two nights before Halloween. Considering it was a Sunday evening, there were many people in the street having dinner, listening to live music, and heading to any of the large amount of bars that the old capital city has. I was overwhelmed by the vibe the city offers just after walking a couple blocks. I mean, La Antigua it’s known by most of its neighbors for being a one of the first colonial cities in Central America, it’s great to walk around during the day and to have a few drinks with friends at one, or two, or three of the variety of bars it hold. Then, sadly, most of my fellow Salvadoran citizens head back to El Salvador on Sunday to get ready to be back at work the next day. I was one of them not so long ago. Now, it was a Sunday early in the evening, and the city was as alive as any other Friday night. I decided to stay for two nights, and then head on Tuesday to this small town that not many have heard about, and that it’s barely a stone’s throw away from La Antigua, if you were Hulk of course. It is actually 30-40 minutes away if taking the straight up microbus (a small van with a capacity of 10 passenger plus the driver, but here the driver’s assistance manage to fit 16 people). 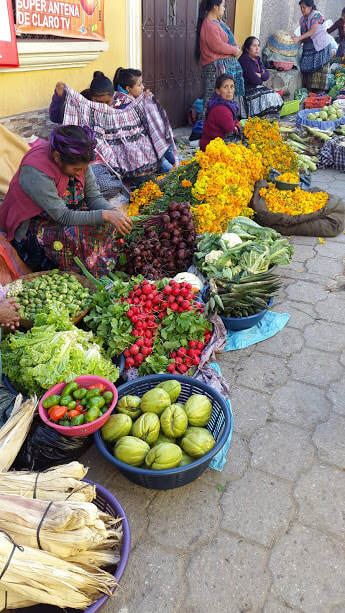 It is cheap, I’m talking about 6 Quetzales (the Guatemalan currency), which is less than a US Dollar. The place where this microbus heads it’s called Santiago Sacatepequez, and it is a gem of a place. When I arrived there on Halloween morning I met with this chaman’s descendent called, Gonzalo, or as his community calls him, “Chalo”, it is a friendly, generous and helpful fellow that I met a day before in Nim Pot (a traditional fabric store near “El Arco” in La Antigua). 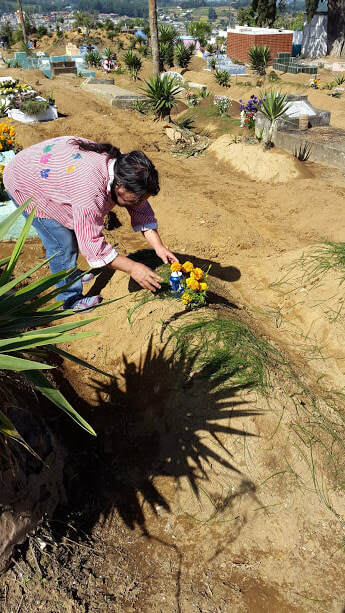 He invited me to his hometown, so he took me for a walk before heading to the cemetery, because it is a tradition to visit the dead, and to bring them fruits, beers and flowers to their place of rest. Some of them commented with me that the elders and the adults of the community speak the language, but that they are having a hard time to pass it to the younger generations, because the youngers want to speak mostly spanish, and are forgetting their ancestors language or they are just being lazy at learning it. 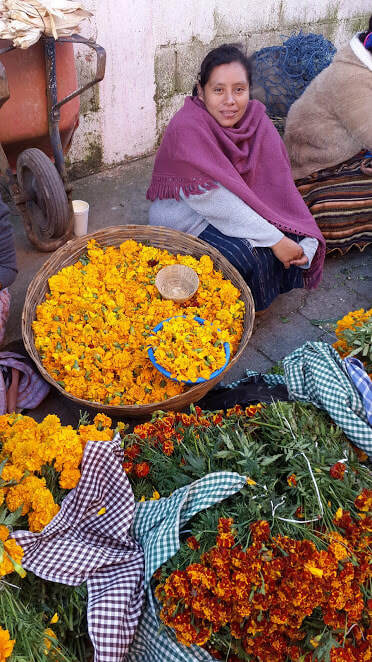 When walking down the street the morning of my arrival I could observe many local women sitting in the sidewalk, wearing their traditional clothes, and selling fruits, and the most beautiful flowers I have ever seen, with colors so intense as if they were out from a Wes Anderson movie. I was amazed. 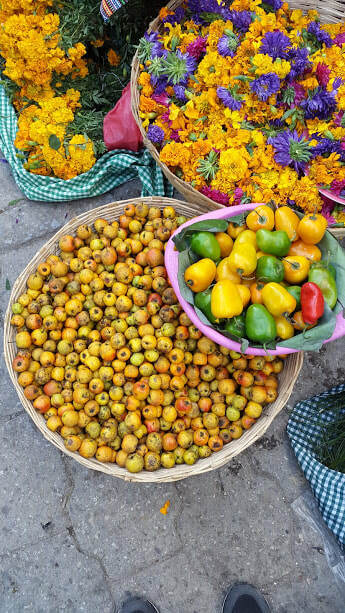 After Chalo bought what he wanted to offer to his lost family at the holy ground we head there, and he performed traditional Mayan customs when offering the fruits and the flowers, then he dropped beer at his relatives tombs. He then proceed to light candles on each tomb, and to smoke cigars with what he described as the souls of his great grandfather and grand mother. 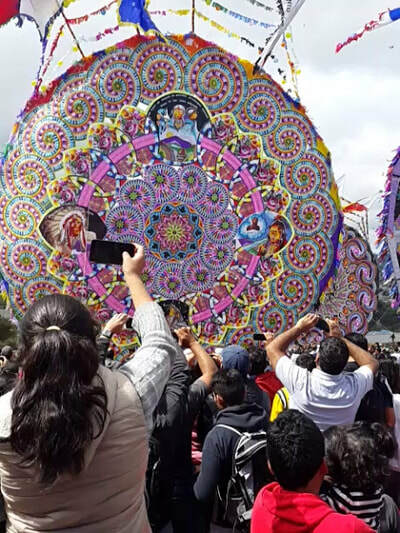 The next day, I could witness a tradition that has been celebrated for 118 years, and that consists in all the young kids and adolescents in the community, to participate in elaborating this gigantic 15-20 meters kites, this is 49-65 feets of circumference. 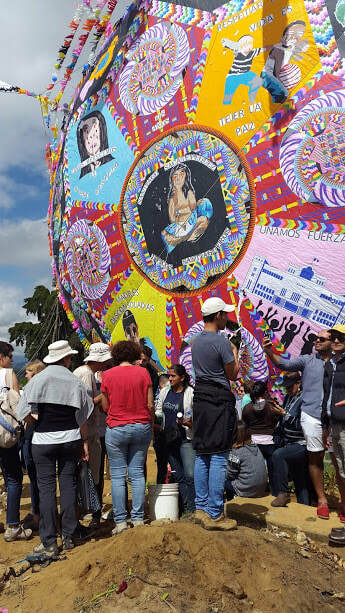 And they present it on November the 1th at the General Cemetery of Santiago Sacatepequez in front of hundreds of peoples that come from nearby towns, other countries, their community and judges. It is a great honor to be the winning team of “Los Barriletes del Dia de los Muertos”, these young girls and boys have been working on their kites for an average of 4 months, day and night, especially when the day to present them gets closer. First, the team work in groups to divide the different tasks that the mission requires, so they ask members of the community to allow them to use rooms for free, and then they start to cut paper, paste different colors into papers, to paint, to draw, to do different patterns that hopefully will fit with the other groups. This takes them more than 2 months, because this all happens during school days and nights. When the parts are finally done and they fit, they move the whole project to a place big enough where 20 meters of paper could fit, it is usually the school’s gym, or a football (soccer) field, or a basketball court. At first I thought, well, it is easy, all you need is a place big enough and that’s it. I was dead wrong, it is not 1 or 2 barriletes the young community works at the same time. 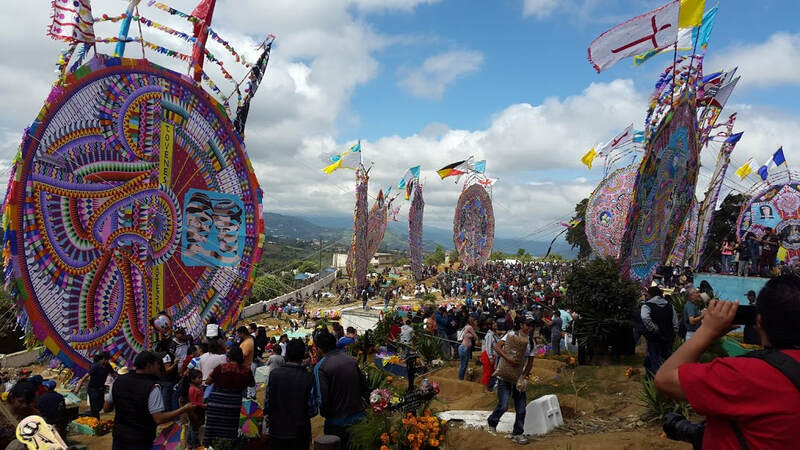 The ceremony I witnessed had 14 barriletes, so, I learned afterwards, that the teams have to move their work to neighbor towns, like San Lucas or Santa Maria Sacatepequez. Girls have a large participation in the process, and they are strong. I saw them, and eventually helped them, carry bamboos that were between 15-20 feet long, then wrap them together in groups of 3 bamboos, and then carry them to the spot where the kites are going to be lifted up from the ground. Each kite has a bamboo skeleton of at least 27 bamboo sticks, each kite requires a group of at least 20 people so it could be lifted from the ground, then there is another group of about 10-15 people that runs to the ropes that have been attached to the kite and pull them so they could rise the kite and show it to the public. Most of the process of bringing the bamboo and moving everything to the cemetery happens during the afternoon and night before Dia de los Muertos. Not many have slept enough for the last couple days before the ceremony, and the tension it is felt, especially when the ladies start to run the show and yell orders at the boys, they all are super brave and strong. It was 5 am on the November the 1st, and I was up and ready to go, me and my new friend walked from his house to the cemetery, and the whole way was packed with people heading the same direction. The streets had people selling traditional clothes, shirts of Real Madrid and Barcelona, hats, pants, and there were many people that had a gas stove in the street selling all kinds of food. 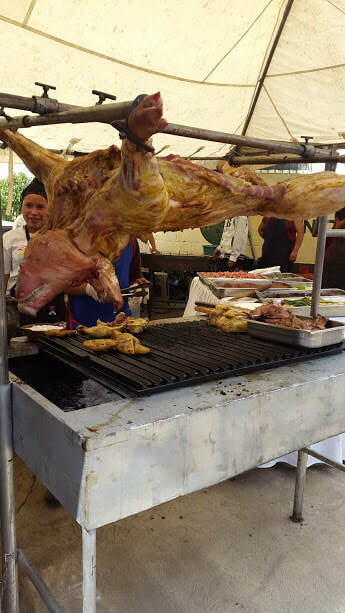 The whole porks on the grill was my favourite, I have a weakness for anything that has to do with pork, and the try was worth it. There were so many people in the cemetery waiting for all the kites to be lifted up and they all clapped and screamed every time each of the kites was being lifted. 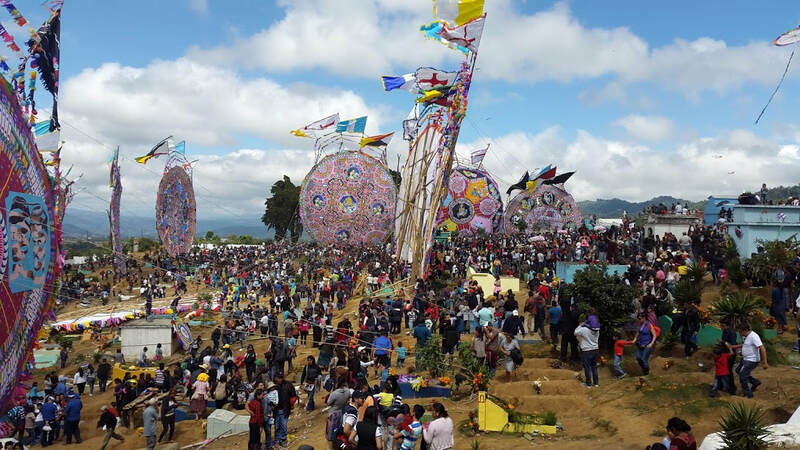 The President of Guatemala, Jimmy Morales, arrived in his helicopter and witnessed the ceremony, and I could hear many comments that don’t have to do with the kites. At the end of the day I was amazed, impressed and excited to have been able to be part, even in a small amount, of this old tradition that brings together in work youngers, boys and girls, and that seems that it’s going to last until the end of times, hopefully.